Let’s get the big answers out of the way . . . We offer a FREE two-week trial. After your trial, we offer programs from $69-$99/mo. Not only is jiu jitsu the most effective form of self-defense for kids, but BJJ promotes confidence, discipline, respect, and many other developmental qualities. Most other martial arts involve striking. Do you really want your child throwing up their fists as a defense to a larger and stronger child? What happens when the fight goes to the ground? If your child trains jiu jitsu, it’s like being a shark in the water when others can’t even swim. 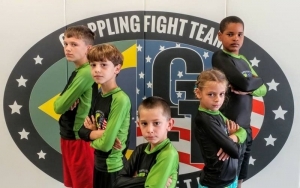 Placing children into a safe, clean, and positive Kids Brazilian Jiu Jitsu environment fosters confidence in a child – confidence that translates well off the mats, regardless of athleticism. Because of the practicality of jiu jitsu, the confidence gained by your child is not a false one. Many martial arts incorporate choreographed “forms” or board breaking. While these aspects may be fun and great for photo-ops, they just don’t carry over into real life scenarios. A false sense of confidence for a child who has been practicing how to block a pool noodle is not a good thing. Today, we see a lot of bullying in schools. Kids Brazilian Jiu Jitsu allows the child to work from the ground and gain dominance – even over much larger and stronger opponents. BJJ allows your child to grow stronger and more confident, and defend him or herself.